The catechism also points out that the Eucharist is both a sacrifice and a sacrament. 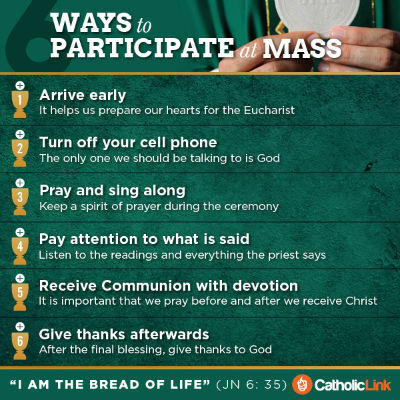 As a sacrifice the Eucharist is the Holy Sacrifice of the Mass. The Mass is the divine action in which Jesus, by the power of the Holy Spirit and through the priest, changes the bread and wine into His own Body and Blood and continues through time the sacrifice He made on Calvary - the offering of Himself for all mankind. At the consecration of the Mass the sacrament of the Eucharist becomes present. Jesus comes to us under the species of the bread and wine. Jesus remains present in the sacrament of the Eucharist as long as it continues to exist. The act by which we receive the Eucharist is called Holy Communion. On the night before he died, Jesus at the Last Supper said, "This is My Body," over the bread, and "This is My Blood," over the wine. As Catholics, we believe that the substance of the bread entirely ceased to exist, and that the substance of Christ's Body completely replaced the substance of the bread. We believe that the wine entirely ceased to exist, and that Christ's own Blood replaced the wine. This change is called Transubstantiation. We also believe that Jesus, by His almighty power preserved the appearances of bread and wine, in spite of the fact that their substances were gone. The Eucharist still looks like bread and wine, still feels like it, tastes like it and smells like it. The change of the substance is a miracle that continues to happen, a hundred thousand times a day in the Mass, by God's infinite power. This miracle requires the right material things to work through, as do all of the sacraments. The valid matter for the Eucharist is wheat bread and grape wine. This is the same matter that Jesus himself used at the Last Supper; therefore it is what the priest must use to enable Christ's sacramental action present to us in the Mass. The Eucharist contains the Real Presence of Jesus: Body and Blood, Soul and Divinity. He is simultaneously present in every consecrated host on every altar throughout the world, and under the appearance of wine in every consecrated chalice wherever Mass is being offered. This is why such care is taken at Mass when handling not only the consecrated Body and Blood, but also the empty vessels, the sacred linens used at the altar, and anything else that comes in contact with the consecrated Eucharistic species. Jesus is present in the Eucharist, not just during Mass, but as long as the sacred hosts consecrated at Mass have not been consumed. We owe our complete adoration to the Eucharist, since it contains the Son of God Himself. A tabernacle can be found in Catholic churches. The tabernacle is a tent-like safe that is identified by a continuous burning lamp. Following an ancient tradition, the tabernacle is often covered with a veil as an indication of the holiness of the place. Within it Jesus is truly present in the Eucharist. Christ's presence makes our churches the "house of the living God" (1 Tim 3:15). That is why we keep a respectful silence while in the church building: to show our respect and reverence of the Lord. The presence of Jesus in the tabernacle makes an excellent place of private prayer for the faithful. Jesus resides in this special place in love for all his people.